In the world of thermoplastics acetal (polyoxymethylene or POM) sometimes gets overlooked in applications as customers consider more well-known plastics such as UHMW, nylon, or PTFE. However, acetal offers excellent versatility, overall properties – all while being the most machinable thermoplastic. Unlike many other plastics, acetal is quite hard with a dense weight that reminds one more of a metal than a plastic. Given this property, acetal can be used to replace precision machined acetal parts that were formally metal. Examples are gears, valves, and parts like the bolt in paintball markers. 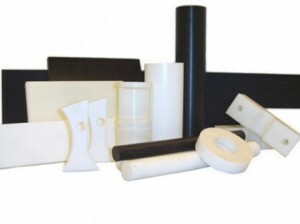 Acetal is often used as a nylon replacement in marine applications. This is because it can take similar load yet will not absorb water like the nylon will. But there is often no reason why you could not have specified acetal as a nylon replacement in the first place. Where acetal really excels; however, is dimensional stability. It is one of, if not, the most dimensionally stable plastic. What this means is it can be machined to tighter tolerances than other plastics and will hold those tolerances better. In addition, it has excellent resistance to creep at normal operating temperature. If dimensional stability in an application is of top priority than acetal should be near the top of your list! As with any plastic, acetal does have some concerns. They are attacked by strong acids and oxidizing agents so keep that in mind. Acetal comes in two common grades the homopolymer and copolymer, with the copolymer being better in hot air or water environments. Acetal is available in FDA approved grades, including metal and x-ray detectable grades. Acetal should not; however, be used with chlorine washdowns or cleaners. In that case PET should be selected as a substitute. For answers to your questions about Redco Acetal please contact us. The U.S. FDA is putting the finishing touches on some major rule changes and the rest of the world needs to take note (read more here). Why? Because these rules do not only affect domestic food but imports as well which must now be held to the same FDA standards. The emphasis of the new rules will be on prevention instead of reaction. Functionally, this means companies will be required to have a written, preventative food-safety plan that addresses food quality concerns. How do these rules relate to plastics? One word: contamination. The threat of contamination is behind the development and recent proliferation of blue FDA approved plastics as well as X-ray and metal detectable acetals and UHMW-PE. These plastics could, and should, play a key role in preventative food safety moving forward. The plastics can be caught by detection machines if they ever break into the food and the blue plastic can be easily spotted by workers on the processing line. There is no excuse why these plastics cannot be implemented: they are FDA approved, have obvious advantages over traditional natural grades of plastic, and are available in several grades – even a FDA approved dryslide (extra low coefficient of friction) specialty grade! Like it or not, these new FDA rules are coming and formulating your preventative food safety plan should involve Redco foodsafe plastics. For answers to your questions on our line of food-safe acetals and UHMW-PE please contact us today. Acetal is an excellent plastic which often replaces nylon in applications with moisture as well as small, precise metal parts. Acetal machines beautifully and can hold tight tolerances. It was one of the first plastics widely marketed in a blue color. This fall we started selling Redco™ ZL 900 Blue®. 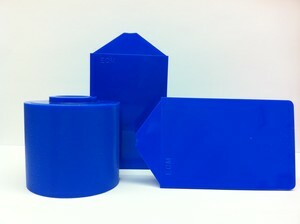 The name sounds “fancy” but it really just refers to standard acetal that we now sell in the color blue. No new properties, heat tolerances, or anything else. Redco™ ZL 900 Blue® was developed specifically for the food processing industry. Blue, as it turns out, is the rarest of all food colors and thus, were blue plastics to ever contaminate food, blue would be very visible. Turns out this is extremely important as many customers would purchase more expensive higher-grades of acetal (available in blue) just to get that color they needed. It was not cost-effective for some customers, whose applications really only required standard acetal copolymer. So while Redco™ ZL 900 Blue® might be a simple solution to a problem, it is also a very important one. Those food processors will now be able to save money by using the regular blue acetal and for the record – it is FDA and USDA compliant. The manufacturer markets the product with the line “…When all you need is the color blue.” That describes the solution effectively in our opinion. 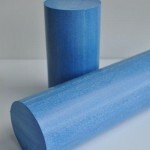 That said, premium blue acetal is still available. Known as Redco™ ZL 900 XMD AB® this high-grade acetal is sapphire blue in color, is metal detectable and antimicrobial. It does require a custom run but is definitely worth the investment for certain applications where standard acetal does not have the required properties. For your next food processing application consider Redco™ ZL 900 Blue®. 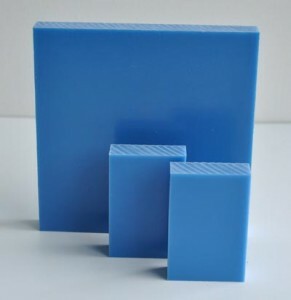 For more information on this product, other acetal grades, or any other of Redwood Plastics’ many products don’t hesitate to contact us. *ZL 900 Blue® and ZL 900 XMD AB® are registered trademarks of ZL Engineering Plastics Inc.
We are proud to introduce another impressive plastic innovation! Redwood Plastics now offers X-ray detectable UHMW-PE, Acetal copolymer, and PEEK sheets and rods for machined parts and components used in the food processing industry. The FDA has introduced the Food Safety Modernization act, and new regulations in place mandate that all food processors have extensive controls and safety programs. The FDA has the authority to recall food due to any kind of contamination and this can be extremely detrimental to your brand. Normal use, wear and tear, and handling of plastic components on processing machinery presents the risk of contamination. Fragments can break off and enter the product during production. Most processors conduct quality checks at control points with either metal or x-ray detection systems. X-ray systems are preferred due to the food, and because the system can detect the contamination after packaging. Redwood Plastics now offers Redco™ Polystone® M XDT and Redco™ Sustarin® C XDT. These are the most commonly used plastics in the for food processing. All of these Redco™ materials have been proven to be deteted in a particle as small as a 3mm cube on productions lines that run up to 250 feet-per-minute. At Redwood Plastics, we’re creating unique innovation to give you peace of mind in food processing. *Polystone & Sustarin are registered trademarks of Roechling Engineering Plastics. Image used with permission of Roechling Engineering Plastics. Redwood Plastics recently played a part in the poultry processing business. Two of their valued customers in Saskatoon have curtain trailers that they use to transport their birds. The Curtain trailers, similar to the one pictured above, run on a slider system where a cable along the top of the trailer allows the curtains to slide to the front for loading and unloading. While this system is convenient, the blocks endure heavy use and frequently wear out from the constant abuse. Redwood Plastics offered these customers a plastic solution that outlasts other options – Redco Acetal. Redco™ Acetal provides strength, stiffness, low coefficient of friction, and dimensional stability that deliver a versatile and easily machinable material. It often exceeds the life of many parts that are traditionally metal. Additionally, custom colours and sizes are available upon request. Another area Redwood Plastics helps the poultry transport industry is by providing a Redco Polyurethane drawer that doesn’t crack or break like other models under the constant use and washing. Redco Polyurethane combines the toughness of metal with the elasticity of rubber. It has the ability to withstand the most severe abuse, making it the ideal material for poultry drawers which are washed often.